Perfect for amateurs and beginners alike, this all-grain pack includes all the essential elements to brew 4 litres of authentic Blonde beer at home! Brewing your own beer! Sounds fun and scary all at the same time! Guess what, it is A LOT of fun and it is EASY, you just have to learn to be patient. 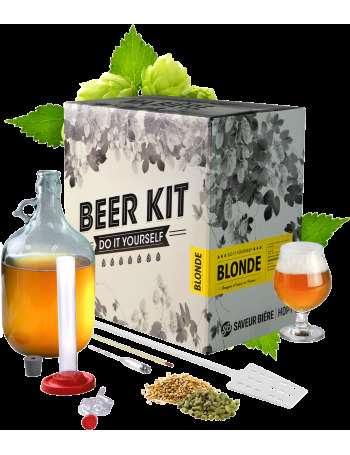 The magic all happens in your home, in your own kitchen and you will feel like a professional brewer with our Beer Kit. So don’t be scared and come and have fun with us, in no time you will be a pro and trying all our different recipes! Happy Brewing! Don't forget to add a bottling kit to your order, including bottles, crown corks, and a bottle capping tool.